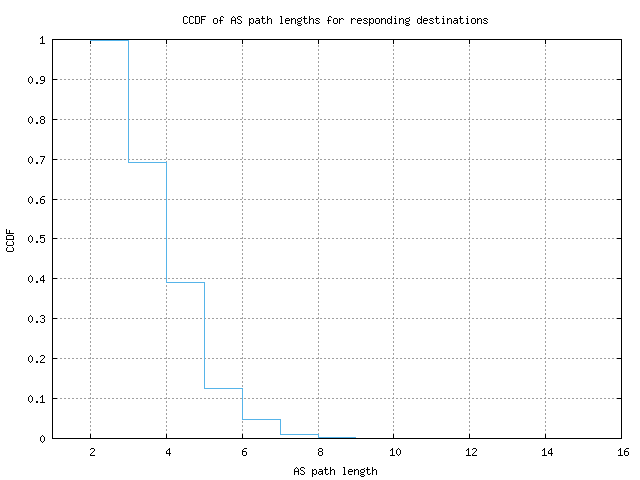 This graph shows the complementary cumulative distribution function (CCDF) of AS path lengths (number of Autonomous Systems) to a destination that responds to probing. By showing the distribution of AS path lengths to all responding destinations, we can get a sense of how closely connected a monitor is to the 'core' of the Internet. The complementary cumulative distribution function shows the fraction of collected data points that are greater than a given value. This is backwards from how percentiles are given, as those show the percentage lower than a given value. On this graph, you would find the 80th percentile at the 0.2 Y value. The AS path length is defined as the number of ASes a probe transits to reach the destination from the Ark monitor. These values are only used when a response has been received from the destination. In other words, incomplete paths are ignored for the purposes of determining AS path length. Because most AS path lengths fall within a relatively short range, the CCDF graphs will tend to have a sharp drop off around the median. A lower median value of AS path length likely indicates that a monitor is closer to tier 1 or tier 2 providers, as it doesn't have to go through many ASes to reach its destinations.